In a document published Friday, sources show that Domald Tromp’s new healthcare revision will eliminate coverage entirely for all human entities. This comes as little surprise, as Tromp has spent most of his campaign pledging to enact policies that would keep humanity in a state of suspended cosmic terror, but it is the first time that the details of such a plan have been made public. 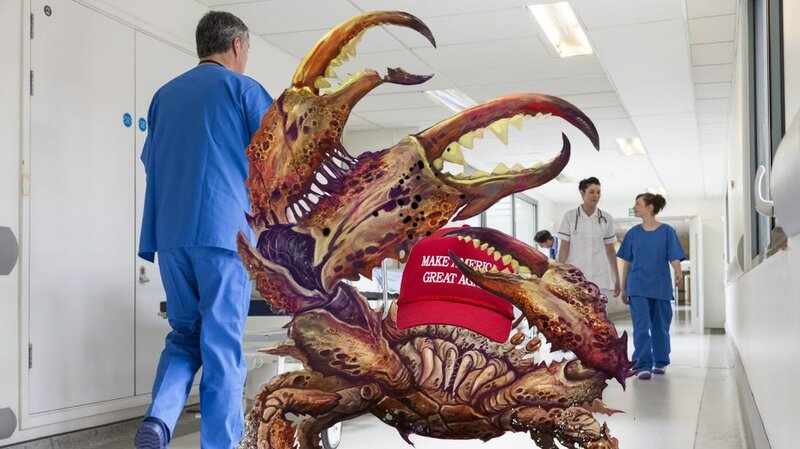 In a surprising turn of events, however, Tromp has pledged to extend healthcare benefits to nearly all creatures of The Void, including Void Crabs, shrieking masses of sentient ooze, devils, and even qualifying reverse twins who have succumbed to the ways of The Void during extended timeline travel. Greater creatures of this infinite cosmic darkness could not be reached for comment as doing so would render any interview insane, their mind struggling to comprehend the implications of their existence on multiple planes. Meanwhile, many shrieking masses of tentacles and Void Crabs were bursting through the skin of their human suits in celebration, thankful that they will be protected from sickness and harm if this revised Trompcare bill passes.